In the quaint English seaside resort of Brighton rests one of the more unusual homes ever built. 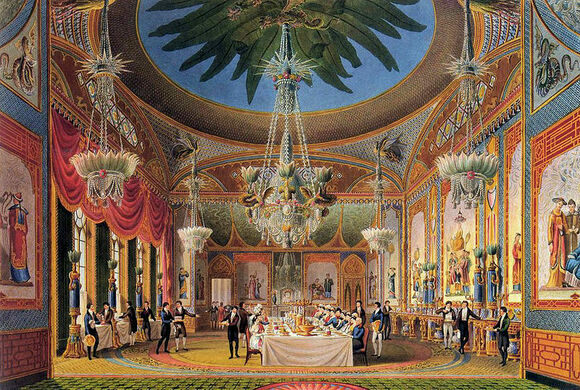 The Royal Pavilion is an interesting, albeit slightly odd, testament to the once mighty power of the British Empire. Having been built from the late 1700s through the early 1800s for the prince regent, George, Prince of Wales (later to become George IV). This concept building is the UK's first attempt at making a permanent structure of nothing but trash. To literally keep their waste out of their own backyards, the citizens of this English city built an impressive sewer system that is still in use today. Designed in the Indo-Saracenic style and taking well over two decades to complete, the pavilion is filled with the spoils of the British Empire, with different rooms dedicated to different eras and styles. The exterior of the entire structure resembles the Taj Mahal more than any other British Royal Residence. 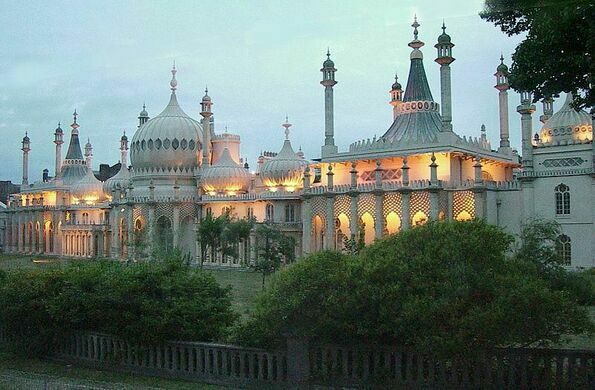 With domes, spires, and complex geometric lattices, it looks almost impressively out of place next to the rather drab, and utilitarian buildings that populate the rest of Brighton. Built during the Regency (the period of English history during which George Prince of Wales was the de-facto head of state due to the madness of his father George III), the Pavilion is the embodiment of many of the ideals of the time. This was the era of Beau Brummell, dandyism, social clubs, and unrestrained and unapologetic excess. Both the interior and the exterior of the pavilion reflect this excess. The chandelier in the Banqueting Room alone weighs over one ton and stands thirty feet hight. Perhaps the most excessively opulent room in a house already oozing an obnoxious luxury through every pore is the Music Room. Lit by nine chandeliers that are shaped to resemble lotus flowers, the walls of the room are covered in red and gold silk, while the domed ceiling is made of hundreds of gilded cockleshells. 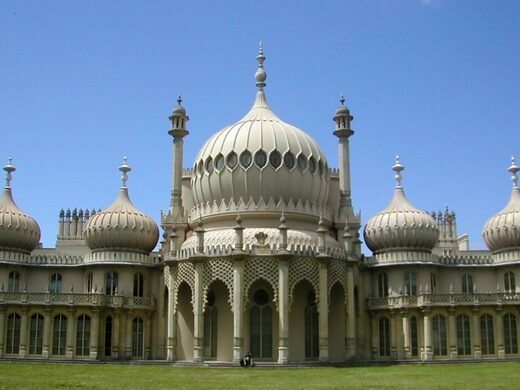 These days the Pavilion is no longer used as a Royal Residence, having been sold by Queen Victoria to the town of Brighton in 1850, but as a museum open to the public. For a fairly reasonable sum you can wander through house marveling at the beauty of the Chinese porcelain vases and the ugliness of the drapes. Half-drowned wooden stumps and stone blocks are all that remain of a Victorian landing that was destroyed by storms.